We finally got around to decorating our little home for the holidays! Lights are up on the windows, garland and bows are strewn on the staircase, and our tree is chilling in its new corner home. Yes, we are proud parents of the cutest little tree there ever could be! We figured we are almost a real family now, so we need to start building our own holiday traditions. With those traditions, come a bit of compromise. I grew up with real Christmas trees. The kind that shed tiny needles everywhere, that are always a bit crooked and a little uneven but that are perfectly imperfect because they smell of Christmas. My fiance, on the other hand, grew up with a fake tree that gets dragged from the basement every year and has perfect little branches for hanging ornaments, and smells of...nothing. Our family tree looks like a Jackson Pollack while his family's tree looks like it came straight out of the Sears catalog. Nothing wrong or right with either of those things, but certainly different takes on what makes a Christmas tree tradition. So this brings me back to our humble tree and the beginning of our new family traditions. I figured our tree is a compromise between the two family traditions. Yes, it is artificial, but it is a bit sparse and awkward. I was even fooled by its lack of authenticity when I picked it out at the nursery. Draped in itty-bitty lights and just two ornaments, it has not yet been a victim of the cats' curiosity. I give it another day or two before our terrifically I-am-pretty-sure-I-saw-that-inanimate-object-move-therefore-I-must-attack-it cat goes after it. Now that our house is decorated, I am feeling festive! So festive in fact, we decided to throw a Christmas party by inviting probably way too many people. The more the merrier, right? For this party, we are going to need food, and this is where this nibble comes in. Green and red from the chard and red and white from the bits of apple, it is the perfect holiday bite. 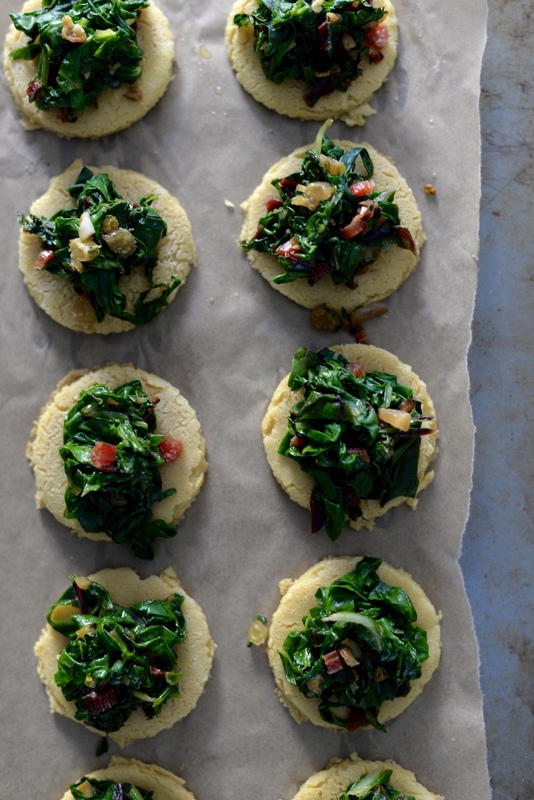 Socca, if you have never heard of it, is a quick flatbread made with chickpea flour. It leans towards the savory side and is quite dense, but if you are thinking it tastes like chickpeas or hummus in baked form, you would be surprised at how different in flavor it is. I dare compare it to a really finely ground polenta with some addicting nuttiness going on. While it can certainly be eaten in pizza form, I make bite-size finger appetizers by using a small biscuit cutter to cut out little rounds. Sure, there are scraps of socca that remain from all of the hole-punching, but they are much appreciated thrown into a bowl of roasted root vegetables and topped with goat cheese. Waste not, want not. 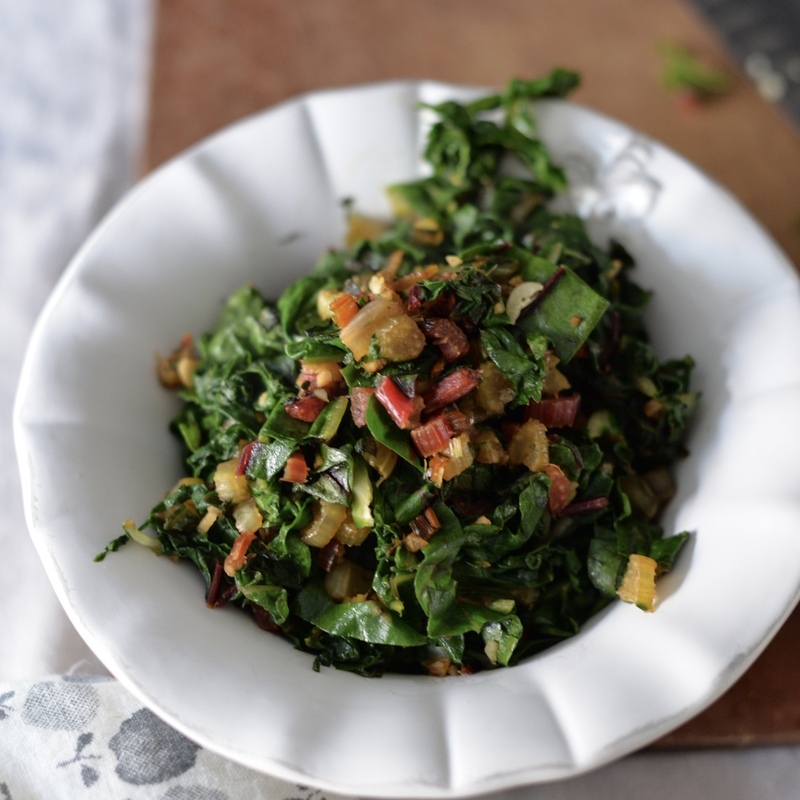 The top is a bit of simply sauteed chard stems and garlic, wilted chard leaves, and a spattering of toasted walnuts. The addition that made this not just beautiful but quite a bit fancy feeling was the apple. I draped julienned apple pieces over top that offered just enough sweet and tart crunch to balance the earthy chard. 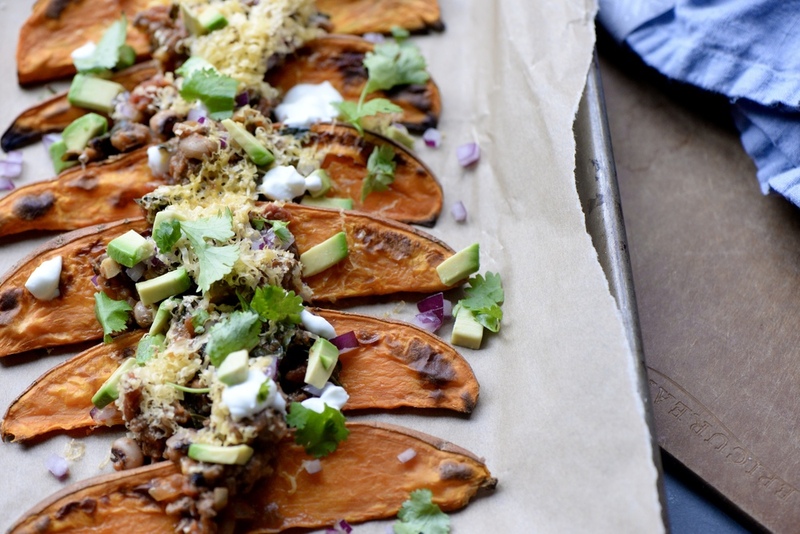 This is perfect party food because it is mostly make-ahead. The socca, chard, and toasted nuts can all be prepared ahead of time. Warm the socca and chard topping through, assemble with the walnuts, and top with apple, and you are ready for your holiday shindig. Prepare socca. Whisk chickpea flour with water, salt, and 2 1/2 tablespoons olive oil until smooth. You can adjust seasoning by tasting batter here if you would like. Allow batter to rest for at least 15 minutes, but up to 1 hour. Preheat oven to 450 degrees Fahrenheit. Place large cast iron skillet in oven on center rack to heat while oven preheats. Remove pan from oven when hot and pour in 1 tablespoon olive oil, swirling to coat. I used a 12-inch pan, but you could do multiple batches in a smaller skillet. Add batter to thickness of scant 1/4-inch (this was all of batter in my 12-inch), and return pan to oven. Allow to cook 15-20 minutes or until golden and starting to pull away from sides. Remove from oven and allow to cool before using a spatula to loosen batter from pan. 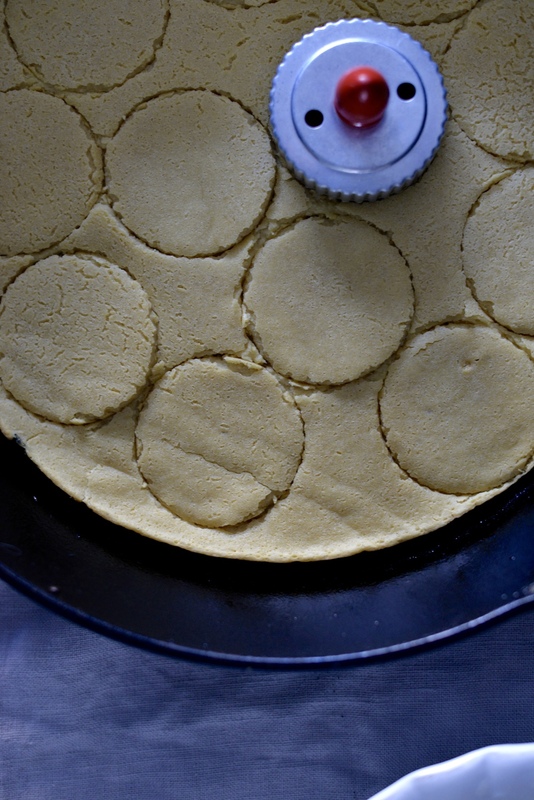 Cut socca into circles, either with a cookie cutter or by tracing a small cup. Prepare Swiss chard while socca cooks. Heat 1 tablespoon olive oil over medium heat. Add chard stems and garlic and cook until softened, about 5 minutes. Add chard leaves and toss to combine, cooking for just a few minutes or until leaves have wilted but still have a little bite. Season to taste with salt and pepper. Assemble bites. 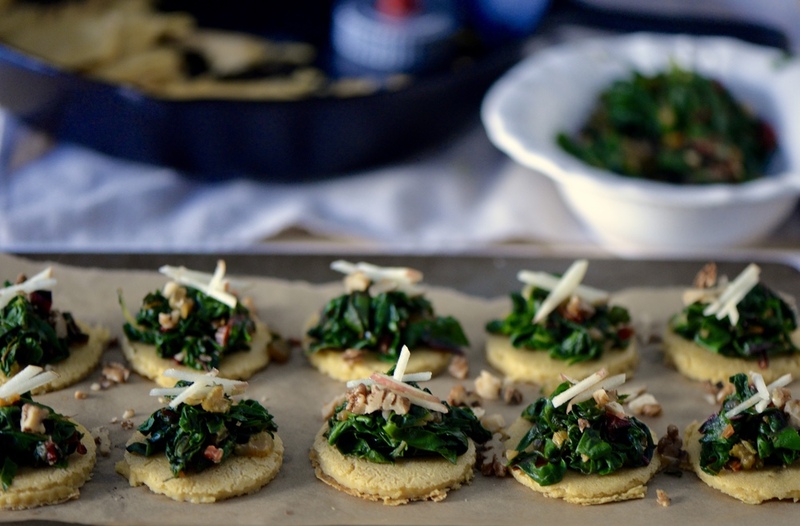 Top a socca round with a little pile of chard, sprinkle with toasted walnuts, and top with apple slivers. Enjoy! Makes about 12-15 bites. One of the main reasons I love eating at Vietnamese restaurants is their summer rolls. Herbaceous, fresh, and clean, they will never go out of style. They are also perfect if you need a break from heavy holiday food. I decided to do a bright autumn version here, and while it is by no means traditional, it is just as bright and clean as the cucumber and carrot version, perhaps just a little more hearty. I use soba noodles instead of vermicelli, which I believe are a bit easier to cook than vermicelli. Vermicelli can be finicky. It goes from underdone to a gloopy, sticky mess in an eye blink, at least for me who has not spent years perfecting it. So if you have tips on perfecting rice vermicelli, let me know! The soba noodles also pair well with the sesame flavors I have in the tempeh and dipping sauce. The marinated and seared tempeh and creamy avocado play off of each other's textures and add some staying power. To mimic the sweetness of carrots, I add in slices of kabocha squash, and the whole thing comes together in a delicious little roll. if you have never played with rice paper before, it is rather simple if you know a few tricks. I fill a pie plate half- way with really hot water, get a dish towel ready out on the cutting board or counter (this helps absorb excess water while you assemble), plunge a piece of rice paper in the water for about 15 seconds or so on until softened. I lay the softened rice paper out on the towel and begin layering on the ingredients. The trick is to keep the ingredients nice and compact, much like you would fill a sushi roll or a dumpling. Then fold the sides in like a burrito and roll away. To keep them fresh as you make them, place a damp paper towel or dish towel over the already made spring rolls. The dipping sauce here is sesame-based rather than peanut or fish sauce-based. You could certainly sub in peanut butter for the tahini, but it will be thicker so you will want to thin out with a little water until the desired consistency is reached. Roast squash. Preheat oven to 400 degrees Fahrenheit. Line a baking sheet with parchment paper. Toss kabocha with tablespoon oil, and arrange in single layer. Bake for 25-30 minutes or until golden. Prepare tempeh. Mix maple syrup, low sodium soy sauce, and sesame oil together in a bowl. Add tempeh and toss to coat. Heat 1 tablespoon coconut oil in a skillet over medium heat. Add tempeh and cook on both sides until golden, about 5 minutes. Remove from heat. Cook soba noodles. Bring pot of water to a boil. Add soba and cook for 5-7 minutes or until just done but not mushy. Start tasting at the 4 1/2 minute mark. Drain in colander and rinse with cold water until cool. Drain thoroughly and toss with 1 teaspoon sesame oil to prevent sticking. Make dipping sauce. Combine tahini, soy sauce or tamari, rice wine vinegar, maple syrup, garlic, and ginger in a bowl. Season to taste with salt and pepper and add hot sauce, if using. Prepare rolls. Fill a large shallow dish such as a pie plate half-way with steaming water. Add rice paper and allow to soak until softened, about 15 seconds. Place on a clean towel and layer ingredients on one end, starting with a small piece of red leaf lettuce, soba noodles, avocado, tempeh, kabocha, cilantro, sesame seeds, if using, and a drizzle of the dipping sauce. Roll up like a burrito, starting with the sides, and then roll up tightly. Place a damp towel over rolled pieces while repeating with remaining ingredients, heating water as necessary. Serve with dipping sauce and additional herbs, if desired. Enjoy! Makes 12-15 summer rolls. One of the shows we love to watch at home is Beat Bobby Flay. I know, I know. It is a cooking competition, which have become entirely too common, too dramatic, and are not much about the actual cookery. But Beat Bobby Flay is one of the few food competitions that I actually like because they are really cooking, sweating, and grinding. Also, the judging is entirely anonymous which makes it feel that much more legitimate. I love to see chefs bring their trademark dish- the dish they are most proud of- and go head-to-head against Bobby Flay. Spoiler alert: Bobby Flay usually wins, but that makes it so much sweeter when the opponent finally comes out on top. The other night, we were watching an episode where the opponent brought their trademark dish- Beef Stroganoff. I had forgotten about Beef Stroganoff and how much I loved it as a kid. It was never very fancy- beef in a mushroom sauce- probably made with Cream of Mushroom or the like, some salty beef stock, and tangy sour cream- all served atop egg noodles. I can still remember slurping those egg noodles. In the Beat Bobby Flay episode, porcini mushrooms and a medley of other wild mushrooms were used, the egg fettuccine was homemade, creme fraiche replaced the sour cream, and the beef? Both Bobby and his opponent used filet mignon. Very fancy, indeed. I suddenly got a craving for Beef Stroganoff after watching that show, but I only had mushrooms on hand. I had made a note a while back to try Sam's beautiful Creamy Miso Mushrooms on her blog, Drizzle and Dip, and I thought it would be a good starting point to get a mushroom-based stroganoff. Mushrooms would provide meatiness and miso would help get that salty richness that I wanted to mimic. Like her, I serve this on toast, but I made a few changes to lighten up the dish and give that slight tang of a stroganoff. I use thick Greek yogurt to mimic the sour cream since I did not have any in the refrigerator, and parsley and chives at the end adds a bright and fresh note. I add in some navy beans for extra bulk and a little texture, but you could leave them out or replace them with chickpeas. Eat as is or top with an egg like Sam. Or serve the mixture atop little crostini for a lovely appetizer. It would be perfect for this holiday season. I will still have to make real Beef Stroganoff soon, but this most definitely satisfied my craving for that classic, rich, comforting dish. Melt butter over medium heat. When butter begins to foam, add mushrooms, stir to coat, and allow to cook until golden and tender, about 8-10 minutes. Try not to stir the mushrooms too much to get a nice color on them. Add the garlic cloves and navy beans and cook another minute more. In a small bowl, mix together the water and the miso paste. Add to skillet, scraping any bits from the bottom of the skillet, and allow to cook until some of the liquid has evaporated and mixture has thickened. Remove from heat, swirl in Greek yogurt, herbs, and season to taste with salt and pepper. Serve atop toast. Enjoy! Makes enough to top 3-4 large pieces of toast. Have you ever had socca? It is a lovely, lovely thing. It is essentially chickpea bread- a sort of flatbread, or really thick crepe, made of chickpea flour, water, olive oil, and salt. It has an umami rich flavor that I find addicting. I have used chickpea flour to make chickpea fries, which are delicious themselves, but those are a little more laborious. One of my favorite places for socca here in Philadelphia is Good King Tavern. They serve it with this melt-in-your-mouth ratatouille. My fiance and I use to order it to share, but I have learned, or I should say we have learned, that I might as well order it for myself as an appetizer to prevent any not-so-nice dinner moments that are sure to spoil your romantic date night out. The inspiration for my version of socca, came from my other chickpea dish love- the popular Spanish dish of chickpeas and greens. I have made many different riffs on this dish, but the basic ingredients remain the same- olive oil, chickpeas, greens (kale, spinach, chard work well), a little tomato paste, garlic, cumin, smoked paprika, and maybe saffron if I am feeling luxurious. Just the smell of this dish simmering on the stove takes me back to Spain. It is a wonderfully comforting dish, and you add an egg- poached or fried- it does not matter- and you have yourself one special little meal. For this, I seasoned the chickpea flour with a flavor-packed puree of blanched kale, olive oil, and some of those earthy, smoky spices. The kale is hardly noticeable in the final taste of the dish, but the little flecks of green are quite pretty- not to mention nutritious. You can eat this plain because it is just that good, or serve it alongside a nice tangy goat cheese, some of my Zucchini Confit with Miso, fresh summer tomatoes, or even some ratatouille just like they do at Good King. Preheat oven to 450 degrees Fahrenheit. Place a 12-inch cast-iron skillet in the oven while oven preheats. Blanch kale. Heat a medium pot of water to boiling. Add chopped kale and cook for 60 seconds. Remove from heat, drain, and remove as much water as possible from kale. 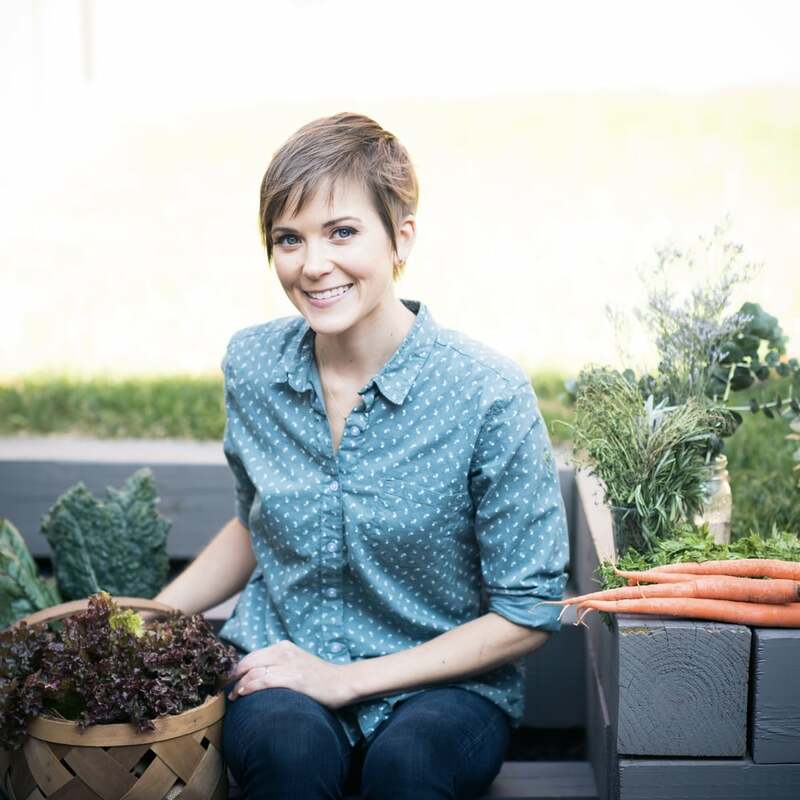 Place kale in a food processor or blender and add smoked paprika, cumin, garlic powder, dried minced onion, salt, and olive oil. Process until mostly smooth. In a large bowl, whisk together chickpea flour with the water. Add pureed kale and spice mixture to bowl and stir until combined. Remove hot pan from oven, and pour 1/2 tablespoon olive oil into pan, swirling to coat. Pour 1/2 of batter into pan, trying to create an even, smooth surface, and then return pan to oven and allow to cook for 12-15 minutes or until slightly golden on the edges. Remove socca from the pan, and repeat with another 1/2 tablespoon of olive oil and remaining batter. Enjoy! Makes 2 12-inch socca rounds.